Pope Francis greets the faithful as he leaves St. Peter's Square at the end of his weekly audience April 10 at the Vatican. 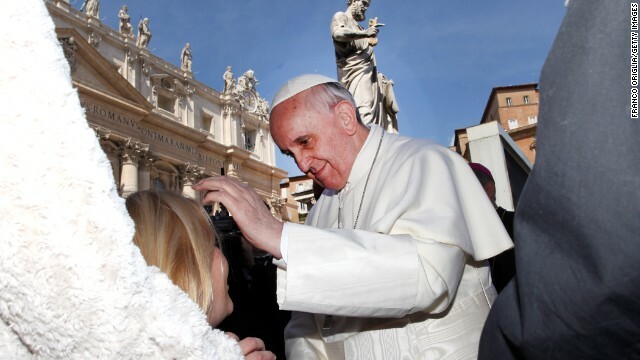 (CNN) -– American atheists welcomed Pope Francis’ comments that God redeems nonbelievers, saying that the new pontiff's historic outreach is helping to topple longstanding barriers. Roy Speckhardt, executive director of the American Humanist Association, said that although he has been skeptical of Francis' outreach to the nonreligious, he welcomed Wednesday’s comments. “I gather from this statement that his view of the world's religious and philosophical diversity is expanding,” Speckhardt said. “While humanists have been saying for years that one can be good without a god, hearing this from the leader of the Catholic Church is quite heartening." Francis’ comments received a great deal of attention on social media, with a number of people asking whether the Catholic leader believes that atheists and agnostics go to heaven, too. On Thursday, the Vatican issued an “explanatory note on the meaning to ‘salvation.'" Rosica also said that Francis had “no intention of provoking a theological debate on the nature of salvation,” during his homily on Wednesday. Although the pope's comments about salvation surprised some, bishops and experts in Catholicism say Francis was expressing a core tenet of the faith. "Francis was clear that whatever graces are offered to atheists (such that they may be saved) are from Christ," the Rev. John Zuhlsdorf, a conservative Catholic priest, wrote on his blog. "He was clear that salvation is only through Christ’s Sacrifice. In other words, he is not suggesting – and I think some are taking it this way – that you can be saved, get to heaven, without Christ." Chad Pecknold, an assistant professor of theology at the Catholic University of America, agreed with Zuhlsdorf, pointing out that the pope’s comments came on the Feast of Saint Rita, the Catholic patron saint of impossible things. That said, Epstein hopes that lay Catholics are listening. The pope’s comments come a few months after he told worshipers that Catholics should be close to all men and women, including those who don’t belong to any religious tradition. "In this we feel the closeness also of those men and women who, while not belonging to any religious tradition, feel, however the need to search for the truth, the goodness and the beauty of God, and who are our precious allies in efforts to defend the dignity of man, in the building of a peaceful coexistence between peoples and in the careful protection of creation,” Francis said shortly after his election as pope in March. Even atheists like David Silverman, president of American Atheists, who has had an antagonistic relationship with the Catholic church, welcomed the pope’s remarks. “While the concept of Jesus dying for atheists is wrong on many levels (especially given that Jesus himself promised hell for blasphemers), I can appreciate the pope's `good faith' effort to include atheists in the moral discussion,” Silverman said. FYI – no one is going any place but a box in the ground, or an urn in the back of a relatives closet. Since you have never been to heaven, I find your statements unsubstantiated and unbelievable. Jesus, however, came from heaven and returned there. He was crucified and rose from the grave 3 days later. This fact was substantiated by witnesses. You, on the other hand, don't have any power over death. Therefore, I choose to believe in someone who does. Your statements aren't "substantiated" either, terri. They're your beliefs and there's no more evidence for their being true than for tom's. "He was crucified and rose from the grave 3 days later." Always a favorite line (a crazy , unsubstantiated one) ...considering nowhere else in history will you find a dead person who has come back after 3 days, what would make one think this to be true? "This fact was substantiated by witnesses." – Except for Jews who were a large part of the community. Show us something that corroborates the story outside the bible. If it was so miraculous, it most likely could be verified by independent witnesses. Respectfully, if there was such a thing as miracles, they would be happening today and at a greater proportion. Christians have the testimony of witnesses to Jesus's death, burial and Resurrection carefully recorded by history. It is not "carefully recorded history." It's been mistranslated by thousands of people over two thousand years. It isn't based on facts but on beliefs. There is no evidence that there was a resurrection at all. None. I would like someone, anyone, to name me ONE, just one, eyewitness to the "miracles" attributed to your dead zombie guy. And also tell me where those writings of the eyewitness are kept Oh, and remember, not a single author, not one, was a witness to anything jeeebus ever did, because NO author of the New Testament ever knew, met, walked with, or talked with, your supposed savior. Peter, James. Sorry that was two. What you believe was written by Peter and James could just as easily have been made up by anyone decades or even centuries later. You can say that about anything ever observed. We can't just deny historical accounts for our own sake of argument, right! No, Marky, that is not the case. There are many sources we can use to verify much we observe; there is no source that corroborates what the Bible says about the divinity of Jesus. Not one. Thanks for your post on this site. From my own experience, there are occassions when softening way up a photograph may provide the professional photographer with a little an inspired flare. Sometimes however, the soft blur isn't exactly what you had as the primary goal and can often times spoil a normally good image, especially if you intend on enlarging that. Thanks for the suggestions you have contributed here. Also, I believe there are some factors which keep your automobile insurance premium lower. One is, to think about buying vehicles that are inside the good listing of car insurance businesses. Cars which might be expensive are more at risk of being stolen. Aside from that insurance coverage is also in line with the value of your automobile, so the more pricey it is, then higher this premium you spend. I think the pope has been hanging out with amanda bynes and smoking a little pipe. He is a more liberal pope than they nave had in a while, but he is sending the wrong message. It is possible to convey arguments/persuade with the weight of the argument itself and not the disrespect. Just because the pope said it does not mean it is true. Respectfully, I think you need to read "The Age of Reason" by Thomas Paine. Thomas Paine was one of our founders along with Jefferson, Adams, Franklin, etc. Or, is your faith not strong enough to withstand such a simple test? Aren't you just a doll, Dickie! You don't know what happens when we die. If you did, you'd be world-famous. As it is, you're an anonymous doofus who enjoys the thought of people you don't like roasting on a spit for eternity simply because they don't believe in something for which there isn't a shred of evidence. I'm sorry to say, but just because you say it, it doesn't mean it's true. By the way, I mean to say what I said above, with respect, and if I have not, I must apologize for my poor choice of words if they convey disrespect. I really wish you bible thumpers were honest enough to admit you LOVE the idea that people who don't believe in your garbage will burn in torment forever. That it makes you feel superior to be "saved". That you AND your god are sadistic freaks. And you wonder why the rest of us say you're mentally ill. There is no heaven, hell or anything else after death. It's non-existence or a 180 back into another body on this planet when available. It sounds like you are expressing a different kind of belief in an afterlife (reincarnation) – reincarnated or not. But wait, god has to be real. Otherwise the bible would be a lie. I suspect the Pope has a better feel for the number of Catholics whose faith is not strong and feel like leaving the church, and that it is a very significant number. Continuing to tell these Catholics that they're hell-bound will ultimately move them to being a "none" or an "other" and out of the Catholic church completely, at which time they would no longer contribute financially. But there may be a mix of genuinely wanting to show mercy to those Catholics who are marginal and non-believers as well – I can't assume or pretend to really know the Pope's mind, but only interpret his words. This would also bring many former Catholics who have left the church back to it again, and back as financial contributors. Catholic churches continue to close around the country. in view of the number of churches closing and the growing group of "nones," I think this is about money, unfortunately, and I say that as a former Catholic and now atheist. But I say that without the vitriol that I hear in the voices of many other atheists, and see expressed on the many faith blogs here on CNN and other places. There are quite a few of us who are not "angry," but are resolute nonetheless. As for Silverman, I have never cared for his abrasive tactics with believers – it's as simple as vinegar and honey. Actually it's not about religion or anything else. Doesn't matter what you believe in or don't. The reality is about the human spirit, the soul, the stuff that pass between you and me every day. And the Pope this too. Religious societies have only managed to find a name for all of this, much like when a place stuffs products into a shop and call it a 7 11 or Quick Stop. Actually, the motivation for doing good deeds does matter, not for the recipient, but rather for the benefactor. "Actually, the motivation for doing good deeds does matter, not for the recipient, but rather for the benefactor." It matters for both. There's a feel good measure on both sides. Yes, the recipient feels only the good either way, but the motivation for the act of kindness is important for the benefactor – i.e., is her/his head in the right place for doing the act of kindness? What do you mean by that, M? Think about it a bit. I have. Your statement that the benefactor has to have his "head in the right place" is not clear no matter how much I "think about it." I'm a protestant minister, so have to say I'm no pope worshiper & have quite a few disagreements with the Catholic Church. But I think what he was saying is this: Thanks to the redeeming love of Jesus, people of good will can work together in THIS world. That's the Spirit of love & you don't have to believe in Jesus for love to work through you. This has nothing to do with heaven. I'm a liberal sort & believe that God accepts ALL – we are just in training pants in our earthly journey. Much more to come. Remember, Jesus was totally comfortable hanging out with the non-religious people of his day. I take that as a sign that the saved/not saved crowd is in for big surprises. So nobody can agree on what Christianity says, and you have special insight on who is really going to be saved. Actually, we don't *know* what Jesus was comfortable with, because none of us actually knew him, if he did exist. We can only pretend to know through what has been cast in stone in the bible, and re-interpreted throughout the ages by various religions. My opinion is that this is another re-interpretation. Men will be judged by their works, not by what religion they happen to be a member of. While I don't believe we will be judged, because I don't believe, I would say that the reason for the good deed is as important as the deed itself. Was it done for selfless (to simply help another person) or selfish (to help one's self into heaven) reasons? It's a miracle! I'm going to heaven! Praise be to the lord! As an atheist, I have to say this kind of post make you appear as an unreasoning person. There is nothing wrong with having faith in a God or a religion. Its when your faith steps on other's beliefs or interferes in Government is when it becomes a bad thing. I am a Buddhist (agnostic-I believe in some force in the universe) but I respect others beliefs. As far a souls go I don't believe that the chemicals and synapses that make up my body are all there is to it. I am me. And Ill continue on in some form I am sure of that. But to the people that don't believe that, I respect your views. I just disagree. This is a prime example of being so open minded that your brain falls out. Seemingly innocent religious faith bleeds negativity to those around them. Especially concerning those with low IQ and limited education. Actually there is something wrong with religion. Belief in an afterlife tends to make us ignore the problems we are creating here on the planet with pollution, overpopulation, destruction of plant and animal species... the list is long. If you believe this existence is only a small part in a longer existence, you will necessarily trivialize this one. I disagree, M. I have known many Christians who live their beliefs and help others not for any belief that their good works will get them into heaven, but because they feel it is part of being human and loving others, the same reason many non-believers do exactly the same kinds of things. I never hear them say that the problems of this world are unimportant because they believe in a heaven. On the contrary, many of them are just as devoted to helping others and solving problems as those who don't believe. NO NO NO! This doesn't help. I just want to be taken off the roster. I don't want any part of Biblegod. He's proven to be too unreliable. I'd rather just die into oblivion than take my chances there. Do I have that choice? Yea, Heaven sounds grand doesn't it? Just wait 'til he has a bad day. He'll flood the place, burn it to the ground or worse! I'd feel like a Pit Bull going to live with Michael Vick. He's ok today, but what about tomorrow? No, I'm holding out for something better! This life is a test of man's faith in God, not the opposite. Argle, please re-read my post and then try to post an intelligent response. So the omniscient guy who already knows what is going to happen needs to test on things he already knows the answer to? What about Esau, Pope? How about the second man crucified beside Christ, Pope? What about those that The Father doesn't place in Christ's hand? No, Pope, as Romans teaches ... Those represented by Adam are condemned and those that are represented by Jesus Christ have eternal life. I think you miss the point of the two thieves.As the Pope said"Do good things".In asking Christ to remember him that thief was showing an understanding that the way he lived his life was wrong & implied regret.The other thief did not.In other words if both thieves had lived,one would go on to live a life doing good things,the other would continue his old ways.Accepting Christ was symbolic of what would have been a change in his actions if he had lived. The pope did NOT say they 'WILL' go to Heaven, in Eternity, for doing a few good acts. Rather he said their lives are "redeemed" (Latin for "bought back") now, so that their GOOD ACTIONS now will have GOOD ETERNAL VALUE. (From this we can hypothesize that they may achieve a slight vicarious blessedness, even if they themselves should end up in Hell.) Notice, their soul, per se, will not necessarily have eternal value, but their actions will. The Bible says as much in the parable of the Sheep and the Goats (Matt. 25:31-46). There has never bween a shred at all to confrim that a soul actually exists. Your exeriences are purely subjective, and provide no proof whatsoever that any kind of deity exists. >" I crumble to the floor sometimes at moments of mistaken ego"
There are medications for that. "Work on your soul daily"
That might be possible if a soul could be shown to exist outside of religion. If this was true, God would have revealed himself/herself to everyone. The fact that this has not happened says a great deal about the belief. However, I would agree that we should all strive to be better people and to help others. The way this reads to me is ... Even Atheists can be saved, if they stop with their non-believing and start believing. If we start to believe, then we're no longer Atheists. Pope Francis's comments seem like political roundabout double-talk. "Sure, Athiests can go to heranve, if they accept Jesus as their savoir". If an Atheist does that, then he's not an Atheist. The Pope never realy answered the question in the first place. Maybe it's a sign that their god doesn't want the gullible who only believe on faith and wants the ones who were intelligent enough to question the existence or perhaps it's the Pope's ploy for more cash for his church. The pope can't be so blind not to see the on-going scandal, so he's losing his flock and needs new recruits-maybe?? Or maybe he's really saying is that even if you believe and DON'T do good things you will not go to Heaven.I think the point of the statement was "to do good things"-that is number one.And isn't that really what Christ's original message was? When asked what His most important message was,Christ said"Love one another".Not believe I exist-or belong to my church.And most importantly-If you don't do good things,can you really say you believe?Do good things=love one another. One day we will all know the truth, obviously not everybody is correct, if there is no God, nothing to loose.If Jesus is the saviour (which i believe) and the only way to be saved is through Jesus Christ and some of you are making a mockery of Him you will have to answer one day. (sooner than you think) the only advice I can give you is, take the bible and read through it from Genesis to revelation, humor me and ask the imaginery God to reveal Himself to you while reading! Humans have worshiped literally thousands of gods throughout history and there isn't a single shred of evidence to support the existence of any of them, even the christian god. So what makes you think that hedging your bet by worshiping the christian god is even the right choice? There's an equal chance that you will be greeted by Hades when you die. Therefore, your argument is silly and pointless. It's also known as Pascal's Wager, and has been refuted several times on this very blog. If God exist, I'm guessing it is far smarter than the Biblegod version! Perhaps I'll be praised for using my critical thinking skills to the best of my ability, rather than abandoning them to faith. Why are so many believers clueless? Threats don't work, Smile. And it's "lose," not "loose." What is more of a mockery,believing in God & not following His message?-Or not believing in God & following His message?It is not the belief or the non belief-it is living the message.Jesus of Nazareth spent His life spreading a message of how we should live-Love one another(AKA Do good things).That was His emphasis,implications of divinity were secondary,occured mostly after His death,& were implied mostly by people other than Him.The Bible tells me so.